It's been a while since I've done a course review. I wanted to try something new in an area that seems interesting, but I'm not sure if I want to do anything with it hobby-wise. 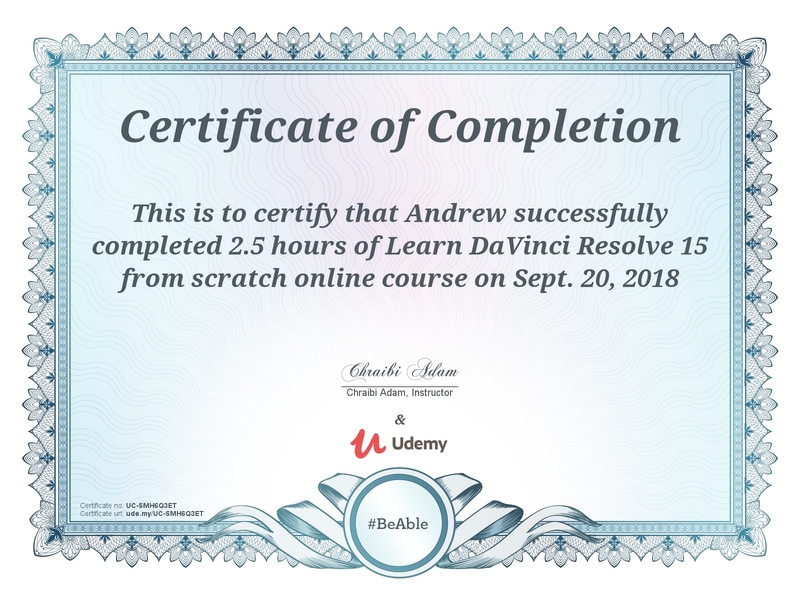 Learn DaVinci Resolve 15 from scratch caught my attention, and I found a coupon code that allowed me to take the course for free. Video editting sounds interesting and I always have the "do something with family videos" on my very distant TODO list. The course is two and a half hours long and it seems to be a basic class. DaVinci Resolve is a very powerful, professional piece video editing software. The free version has everything I'd ever need for home use or even YouTube content. The paid version adds in multi-user collaboration features, additional 3D tools and new Resolve FX. Learn how to use DaVinci Resolve to create beautiful and stunning videos for the world to see. That said, it does provide a good overview of each of the tabs in DaVinci Resolve. The explanation of what each tab is used for and the very basic examples of how to use each give users an idea of how powerful DaVinci Resolve can be. As an overview of the interface for DaVinci Resolve, this course is good. As a "learn from scratch" course, the interface overview quickly shows that two and a half hours isn't enough time to learn the software beyond the very basics. The title is a bit misleading and as someone who didn't know anything about DaVinci Resolve and only took this course because of a potentially budding hobby, I was hoping for more than a two hour tutorial on where to click in the interface to do the basics. Alas, my ignorance of the topic meant I wasn't able to judge the course accurately. I had several nit-picks with the content too. For one, I was immediately turned off to the course creator when they begged in the first lecture to not give them bad reviews. That isn't the type of thing I expect from someone who's put time and effort into creating the course. I was worried when this was done, but it turned out to be better than the begging implied. My second complaint is about how the content is presented. This is a course on video editting. I expect a certain amount of care to be put into the presentation of such a topic, but the course wasn't well paced. There are very abrupt endings to several lectures. There are other lectures that have long periods of silence at the end. There are also more than a few occasions where the audio and video seem to be out of sync. You never see the instructor, but when they are presenting a new tab and say something like "Click on this tab" and then the mouse doesn't move to the tab for a few seconds it makes it hard to follow along. My final complaint is how incomplete the course is. There is one five second lecture that is just "This lecture will be uploaded very soon". The last bonus lecutre ends with "See you at the next lecture", but there are no more lectures. I realize the course was released this month, but it's incomplete. The full price of the course is $80. I expect more to be completed for that price. This is a good overview of the DaVinci Resolve environment. I understand what each tab is and how I can use them for basic edits. I feel comfortable enough to make a very simple video with some home videos now. If you are paying for the course, you should avoid it for a while. It's not complete. There is no guarantee that additional lectures will be added and the promise of "more to come" isn't worth the full price. If you are looking for an overview of the most important buttons in DaVinci Resolve, this is a good course. If you are looking for details on what every button or menu option is going to do, this course doesn't cover that. Finally, if you are really looking to "learn DaVinci Resolve" and not "learn the DaVinci Resolve interface", this isn't the best course either. There are some tutorials here, but they are not the majority of content.